Meadowlark Gardens Winter Walk of Light is an annual tradition for many families in the greater Washington D.C. area. This festive holiday display is found in Vienna, Virginia, just 30 minutes from downtown Washington D.C. 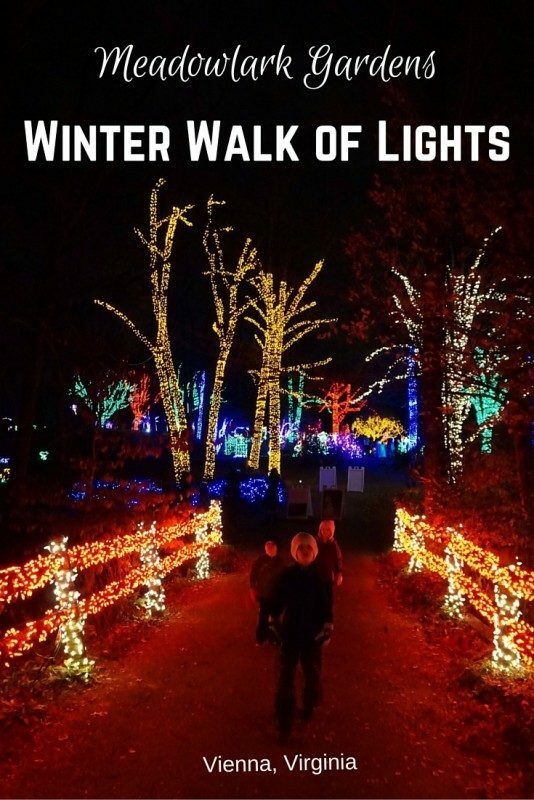 If you are looking for a high-quality lights display, here is everything you need to know about Meadowlark Gardens Winter Walk of Light to help you plan your outing. The 0.6 mile trail is paved and easy to navigate. You could easily take a stroller anywhere on this walk, and the entire trail is ADA accessible. Little legs won’t tire out, but the trail does wander up and down a few hills at Meadowlark Gardens. I knew before we went that it was 0.6 mile, so I expected our visit to be short, but we sauntered along and enjoyed all the displays and spent nearly an hour outside enjoying the lights before we reached the end. You can take it at whatever pace you like, but there is plenty to stop and enjoy along the way. My kids loved racing through this tunnel over and over again chasing the changing colored lights. As you enter Meadowlark Gardens, take a few minutes to enjoy the Atrium. We looked for frogs and lizards in the glass displays and took a family picture in a beautiful sleigh. If you are looking for a souvenir, mittens, hats, and other light-up toys are for sale before you enter the walk. My kids found coloring pages and a fun scavenger hunt of things to look for along the Winter Walk of Lights. Meadowlark Gardens favorite animals and plants are on display throughout the walk. We loved the moving animals, such as the woodpecker and reindeer who “looked up” as we approached, or the fish who swam down the stream. Several aspects of the show are animated, so enjoy the movement and sound. My kids spent a few minutes sitting in Adirondack chairs to enjoy Christmas carols and a light show in one section. At the end of the walk, you will find a large fire pit. You can purchase marshmallows for roasting, s’mores kits, and hot chocolate or hot cider. You can purchase reserved tickets online, and advance tickets are recommended. Choose a timed entry and you can save a few dollars per ticket by purchasing an advance ticket. As with most holiday events, weekends and holidays will be more busy and cost more as well. If you go early in the season, you can usually find a discount code online good for Monday-Thursday admissions. There are 4000 reserved tickets per night available. Once those are gone, they still accept walk-up guests at the doors, but you will pay a little more. The Meadowlark Gardens Winter Walk of Lights opens in mid-November and closes just after New Years. Fees range from $12-14 for adults, $7-9 for kids ages 3-12, and free for children under 2. Click for details on pricing and to purchase advance tickets online. My family loved Meadowlark Gardens Winter Walk of Lights. It felt like the perfect way to kick off the holiday season and enjoy the magic of Christmas. Disclosure: I received a complimentary admission to Meadowlark Gardens Winter Walk of Lights for the purpose of reviewing it for you, but I happily paid for my family’s tickets to this fun event. Wow! This place is really awesome. May be, I have seen this place in TV Channel. Wow, this place looks amazing. What wonderful pictures! Would love to take the grandkids to see the lights but unfortunately its too far away. Maybe we can make a short trip one year!